Before my work commitments took hold, James and Matt whisked me once more to Mt Gravatt for some of their favourite vegan eats in Brisbane. This time the venue was Loving Hut. It shares the same logo, spartan plastic decor and allegiance to Supreme Master as the Melbourne outlet; however, it's been around a little longer, offers freezers of take-home mock meat, and incorporates some Western dishes into the predominantly Chinese menu. Again I took cues from Matt on what to order. I started with the daggy-fusion wontans, which were stuffed with vegan French onion cream cheese and served with sweet chilli sauce ($6). The rosella iced tea ($5.90) had the fruity hibiscus flavour I was nostalgic for (my Queenslander grandmother made killer rosella jam), but I didn't much care for the fresh mint garnish. James has a soft spot for the lasagne and amongst the curries and mock meat there's also spaghetti bolognese, mushroom carbonara, polenta and garlic cutlets. Everything is vegan, with gluten-free and onion-free options clearly marked. There are desserts, too, but they did not come recommended by my hosts. While you can avoid the desserts, it seems that all patronising Loving Hut put themselves at risk of poor service. My dishes arrived promptly enough, yet James' wontans were served a perplexing 20 minutes or more later, and cold. Even then, James finished his two courses entirely before any of Matt's food arrived. A third unordered plate of wontans turned up and were turned away before we finished. It seems that haphazard delivery (and a trip out to the 'burbs) is the price you pay for a cheap mock meat meal in Brisbane. Theresa the Tropical Vegan visited Loving Hut a few days after me but beat me to posting! She was disappointed by the garlic butter cutlets. Otherwise, I've barely read a negative word about this outlet, see Soy Bien (who used to work there), blogmeetsgirl, @djackmanson, Forking Diana, Kamina the Vegan, grey grid paper, LEONG MING EN FOOD PHOTOGRAPHY, vvoc.org, BrisVegan, Loquacious Laetitia and Flash Fiction by Annie. Accessibility: We accessed Loving Hut from a basement carpark via narrow stairs, but there looks to be some street-level parking and flat access from the footpath. The entry is very wide and the interior is flat. Indoor tables are moderately spaced, front outdoor tables were widely spaced. We ordered and (James again!) paid at a high counter, then food was brought out to us. I didn't visit the toilets. On Sunday morning I jumped on my bike early and hit Burnley for a 'fun' run. 10km and a fair bit of pain later, it was time to find some brekkie. For some reason, I've got a blind-spot when it comes to Richmond - I'm sure there are dozens of cafes around, but when trying to think of somewhere that would serve vegan breakfast for my running buddy Bec I was stumped. Luckily Bec had an idea - New York Tomato, which I'd never heard of, but which, it turns out, has an excellent reputation and supposedly some decent vegan options. Although I didn't realise it at the time, New York Tomato's name comes from its location, the corner of New and York Streets in the back-blocks of Richmond (not sure where the 'Tomato' part comes from). At 9:30 in the morning things were just warming up, so we easily snared a table in the courtyard (the bitingly cold wind probably helped). The menu does suggest that they know what they're doing - vegan dishes are clearly labelled, as are vegetarian and gluten-free options. 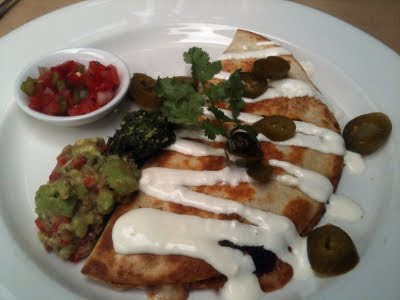 I considered the baked eggs or the carrot, chickpea and fetta fritters, before settling on the quesadilla (refried beans and cheese, topped with jalapenos, salsa, sour cream, guacamole and coriander pesto, $16.50). This was the perfect post-run breakfast, hearty and filling and loaded with spicy goodness. I could have eaten two. Unfortunately, the vegan dishes didn't fare quite so well, largely because the kitchen had run out of beans. It's clear that the cafe is trying to cater to vegans, but without the beans there wasn't much filling on offer. The coffees were pretty good and the service was helpful and reasonably efficient. By the time we packed it in at about 11 the crowds had started to take over, to the point that people were having to queue for tables. There's no way anyone is just wandering by New York Tomato's location, so it's clear that they've won plenty of fans around the neighbourhood. It's pretty easy to see why - the space is lovely (and would be even lovelier if the sun was shining) and the menu is loaded up with delicious-sounding goodies. It's not cheap, but if you're in the neighbourhood, it's well worth a visit. We're late to the New York Tomato party - Petit Miamx, The Very, Very Hungry Caterpillar , available all day, Once a Waitress, Chekoala, Ronnie's Spots, Let Me Feed You Melbourne, table to tummy, Yellow Eggs, melbourne gastronome, kate and zoe... and the kid, Do You Want to Stay for Breakfast?, Boobpop's Brunch Blog, Melbourne's bargain foodie, Gastrogasmic, Poppet's Window, food, glorious food, tell her she's dreaming and Adventures of Java Jane have all given it the thumbs up. Julesgourmand and eggswithsides were a bit less enthused. Accessibility: The courtyard has a flat entry and isn't ridiculously crowded. There are two more levels of tables up some stairs. The toilets (which I didn't visit) are on the top floor, so aren't particularly accessible. I'm visiting Brisbane for work. Priorities in order I headed straight from the airport, suitcase and all, to Kuan Yin for lunch. Thankfully I had a few hours to digest my 3 combo veggie bento and rose milk tea before meeting up with James and Matt for dinner. These generous souls drove me out to the 'burbs for my first taste of Su Life. Su Life isn't one for ambiance - it's bare walls, bare tables, flourescent lighting, and zero music set in a strip mall. No matter, we were here to fill the air with chatter and our stomachs with deep-fried everything. Briefly consulting with James, Matt ordered (too much) for the three of us. The Golden Toona Pancake ($6.50) is crispy and lightly seasoned. The Combination BBQ set ($15.50) is an outrageous quantity of snacks served in a gaudy butterfly platter - the satay skewers and spring rolls were par for the course but the other two appetisers were new to me. In the foreground are crumbed rice paper wraps stuffed with yuba-based mock meat. My favourites, though, were the lacy-wrapped two-toned taro rolls pictured top right. The veggie calamary (sic, $6.99) were, from dim and distant memory, a pretty impressive imitation of the real thing. The sweet and sour veggie ribs ($14.99) are one of Matt's favourites. The sauce was a little undercooked this time, and the mock meat was unusual - sliced thinly with a spongey, grainless texture. The highlight, though, was the Spicy Crispy Chicken ($14.99) - Matt knew it and rashly ordered two plates! I couldn't stop picking at it - the chicken was more batter than mock and undeniably crispy, smothered in a sweet, salty and slightly hot sauce. The capsicum, celery and cashews really worked with it. This is the dish worth catching the number 150 bus out to Mt Gravatt for. I hear that the 85 dishes across Su Life's menu are a bit hit and miss, but I benefited from James and Matt's devoted sampling across many visits. It'd be nice to make a couple more, myself. On their blog, James and Matt deem Su Life one of the two best vegetarian restaurants in Brisbane. It has also received positive reviews on vegawesome!, Viva la vegan! and la petite foodie. Meanwhile on Little things, Arly recreates the spicy crispy chicken as tofu. Accessibility: The strip mall has a step up to pavement level, then Su Life itself has a flat entry and reasonably well-spaced tables. We ordered at the table and (James) paid at the counter. Toilets are located down an alley, were the subject of a hilarious Matt story, and did not sound accessible at all. Update 27/1/2019: The Beaufort has, sadly, closed down and been replaced by a pizza place. As if the Gasometer weren't constant temptation enough, another watering hole battered and deep-fried in Americana has popped up near our abode. Michael spotted a review of the two-month-old Beaufort in Broadsheet and we met up for an early dinner that very night. The menu is an economical single page, headed up by a range of burgers, following through to Buffulo wings and a tofu salad, then finishing with the small stuff - corn chips, corn cobs, slaw, chips, onion rings and deep-fried pickles. Vegetarian options are marked and they even specify that the girlfriend burger (a chickpea and spinach patty with rocket and spicy mayo on a bun, $10) contains egg - this bodes well for vegans elsewhere on the menu! Gluten-free items aren't marked, but there are coeliac-friendly buns available on request. Michael insisted that we sample those deep-fried pickles ($5) - the sour and watery subject is a nice contrast for the hot crisp batter, and they're great dippers for ranch dressing. I reckon the leftover ranch was also the best dressing for my side of onion rings ($2.50 with a burger) - here the onion adds the faintest hint of savouriness and structure to a mass of batter. We preferred ketchup with Michael's handcuts (also $2.50 when accompanied by a burger), which showed promise but were a bit underdone. His Veggie Sloppy Joe ($9) lived up to its name, spilling soy mince and jalapenos with every bite. With the sides eaten I unwrapped my Philly Cheese Fake ($8), a white roll all steamed up with the heat of mushrooms, capsicum, onion and melted provolone. It's a stellar way to mock meat without mock-meat. We liked the Beaufort's mixed drink list too - we're going through a bit of a ginger beer phase right now, and there's three ways to spike it here. At a different time of the week I might even stretch to one of the recommended stiff drinks. The music's loud and the lights are low - the Beaufort is arguably more bar than pub. (We'll leave it to our pub club to fight that one out!) But there aren't many bars or pubs that do food this cheap and charming. Accessibility: The Beaufort has a single step on entry and notably spacious table arrangement - mostly at standard height and with few tables at tall bar height. The lighting's dim and the music is loud. Ordering and payment happens at a high bar, though food is brought to the table. We didn't visit the toilets. The vege box cabbage supply just won't quit; thankfully we haven't exhausted our uses for it yet! A couple of years ago Carla blogged a Waldorf salad she ate in Berlin and I filed it away. She didn't have a recipe but I recall that the idea of candied ginger and cashews in an apple-and-cabbage salad appealed to me enormously. I had a go at my own version this week, adapting Viva Vegan's cashew crema recipe as a dressing and throwing in some fried tofu cubes for protein. I'm not sure I've hit on my ideal version here, but it's pretty close - crunchy and tangy, not too creamy. Chop the tofu into 1cm cubes. Heat the sesame oil in a frypan and add the tofu. Stir-fry the cubes for a couple of minutes until they just begin to brown, then add the vinegar and agave nectar. Allow it all to sizzle for another minute, then turn off the heat and allow the cubes to cool. Thoroughly blend the cashews in a spice grinder, blender or food processor. Add the water, half of the lemon juice, the agave nectar and salt and blend it all until smooth. Leave the skin on the apples, but remove their cores and chop the flesh into chunks. Place the apple chunks into a salad bowl and pour over the remaining lemon juice, stirring it through to prevent browning. Mix in the shredded cabbage and chopped celery, then stir through the cashew cream until it evenly coats the salad. Fold in the tofu, ginger and walnuts. Your salad's ready to serve! Update 31/12/2014: Residential Kitchen has closed down and been replaced by Naughty Boy Cafe. Cindy and I have been talking about going to Residential Kitchen for ages - it's just up the road, has a decent reputation and is open for breakfast, lunch and dinner. Somehow we've just never got our act together though - either riding the tram further up Lygon to Small Block or Mankoushe, or going for an even more local option in Cafe Lua or Le Miel. But we finally remembered, using a lack of milk in the fridge on Monday morning as an excuse to venture up the street to check it out. It's a nice big space, with high ceilings, big windows and a laid-back vibe (at least at 8am on a Monday). The brekkie menu is pretty straightforward, with a few original twists. I went for one of their wackier options: a breakfast burek ($16). This is a big pastry scroll, plunked on a plate of white beans and topped with a poached egg and a sprinkling of dukkah. It works a little bit better in theory than in practice - the pastry ends up a bit soggy from the saucy beans, and there's a slightly odd combination of flavours. The burek itself is a tiny bit sweet, up against the savoury bits and bobs around it. Still, it's nice that they're trying something out of the ordinary. Cindy went to the other end of the scale, ordering the most basic thing on the menu: toast and spreads ($6, served with vegemite, marmalade and fig jam). There's not much to say about this really - it was toast. Good bread, toasted nicely and a decent array of spreads to sample on it. The coffee was good (they're using Campos coffee) and the service was fine. That's about the best way to sum up the whole experience: fine. Good but not great. I'm glad we finally got there, but I'm not sure we'll hurry back. Residential Kitchen has a few blogger fans (e.g. Skinny Glutton and Review Me Benny! ), with a particular reputation for being child-friendly (see little eats and Hey Bambini). Accessibility: Residential Kitchen has a very spacious interior. We paid at the counter, but I'm pretty sure you'd get full table service if you were a little more patient than us. We didn't check out the loos. On the Sunday morning after the VegMel picnic, Cindy and I had (along with cracking sugar hangovers) a big pile of leftover slaw to use up. We pondered our protein options, deciding to avoid one of our regular tofu recipes and try something new: Lucy's amazing-sounding fried tempeh. We had almost everything we needed in the cupboard already, meaning I just had to duck out and grab some tempeh and we were ready to roll. Ours didn't quite work out the way it was supposed to, largely because our kecap manis isn't at all syrupy (it's more or less the texture of soy sauce) and I unthinkingly followed the recipe anyway, meaning that the sauce was a little too liquidy. It still tasted delicious though, the tamarind flavour in particular seeping deep into the tempeh. The key to kicking this dish up from 'good' to 'great' is the sprinkling of fried shallots on top. Don't skimp! The photo above has the bare minimum required. I sprinkled chilli flakes on top as well, but Cindy thought the tempeh was tasty enough as it was. Melt a decent puddle of coconut oil into a wok and, when it gets nice and hot, drop about a quarter of the tempeh in and fry it up until it's a bit crispy and has turned nice and golden. Repeat with the rest of the tempeh, refreshing the oil as needed. Combine the rest of the ingredients in a small saucepan and simmer lightly until the palm sugar is melted through (I'm not sure if we're doing something wrong, but our palm sugar is so hard as to be essentially un-grateable at room temperature). Heat the wok up again with a smear of leftover coconut oil in it, and throw in the fried tempeh and the sauce. Simmer it all down until the sauce bubbles away to nothing and the tempeh is coated nicely. Serve with leftover coleslaw, fried shallots and chilli flakes. Saturday marked the third birthday of Planet VegMel, your one-stop shop for Melbourne's veg blogs (aggregating the feeds of, at last count, 57 vegan and vegetarian blogs). To mark the occasion, Steph and Danni kindly organised a potluck picnic in Edinburgh Gardens (long-time readers will note the similarities to last year's vegmel birthday shenanigans). They also put together this fabulous zine, featuring cover art by Cindy and some fabulous articles on veggie Melbourne. Cindy and I were both feeling like making fairly simple potluck contributions this year and, with a red cabbage languishing in our fridge, this Ottolenghi salad (skip past the lamb shanks if you're following that link!) seemed like a pretty safe option. It's vegan, gluten-free, has the typical Ottolenghi array of flavours and textures and meant we'd at least have something vaguely healthy to eat before all the desserts. There's a little bit of work involved - lots of chopping and grating and some careful dry-roasting of nuts and seeds - but it's really only about forty-five minutes of faffing about. The results were pretty good - the nuts and seeds adding some crunch to all the veggies, and the herbs and dressing keeping things tasty. It wasn't the standout of the picnic (Hello vegan cheesecake! Hi delicious soy bombs! ), but it was fresh and pretty good - definitely one to make again. In typing up the recipe, I realised that I completely forgot to add in the dried apricots - they'd have added some nice sweetness to the salad, so don't make my mistake! Combine all the salad ingredients in a large bowl and stir the dressing through (if you're making this ahead of time, don't add the nuts until you're about to serve it up to make sure they stay a bit crunchy). Every now and then, often while I'm indexing our restaurant posts, I feel a pang of guilt that we don't review more southside eateries. When we first moved to Melbourne we didn't know many people and the two of us would use our weekends to jump on trams down to St Kilda, Prahran and east to Richmond, even while covering the vegetarian essentials in Fitzroy. Now it's just too convenient to stop by our staple inner-north hang-outs with our (mostly) inner-north pals. But we're currently working on a little project that we're hoping will pull us south of the river more often in the next few months. It pulled us first to Colonel Tan's. Years ago @melbgastronome and @eatingwithjack alerted us to their veg options, and it just never happened. I felt immediately remorseful as we climbed the stairs and entered the dining space. The glam-grunge style warmed my inner-north hipster heart, the availability of both couches and lightly padded retro chairs cheered my aging back, and the DJ's indie Brit tunes were literally and figuratively music to my ears. The cages around the DJ booth, upper bar and kitchen window hinted at the messy night club incarnation of this venue that I probably didn't want to stick around for. At 6:15pm we had our pick of the tables and plenty of time to linger over the menu, though the dining area filled rapidly around us. It's twisted Thai on offer - chicken and bean curd are stuffed into "Chiko rolls", bolognaise gets a Bangkok makeover and pork souvlakis are dressed with garlic, chilli and soya bean sauce. Dietary features aren't marked but the menu's about one-third vegetarian, skewed towards the entree end. Vegans should do OK, and coeliacs would need to focus on the curries and stir-fries. We started out with sweet potato and cashew dumplings dipped in chilli soy (foreground, $12.50) and corn and coriander fritters smothered in sweet chilli (background, $9.50). Both had lovely tender textures, but relied almost entirely on their condiments for flavour. Given the portion-to-price ratio of our entrees, we would never have predicted the bounty of chilli-salted fries to be had for $5.50. There was plenty of mayo for dunking, too, so they had us feeling pretty chipper. The most fusion-fied of the vegetarian dishes is the tofu Whopper with peanut sauce ($9.50). It'd be no less difficult to eat it on your own than it was to divide between the two of us - the somewhat silken battered tofu slides between layers of tomato, cucumber, lettuce and carrot, and there's peanut sauce everywhere your fingers want to be. It's a likeable burger, but it could do with a little more heat. Colonel Tan's lined up a lot for me to like - a comfy spray-painted space, cocktails, mocktails and a fun mash-up of a menu - but the food didn't quite make the final smack-down. We appear to be in the minority with our meh food feelings! Colonel Tan's comes recommended by fellow vegetarian The Big V, plus omni blogs I'm Hungry, I'm So Hungree, please sir, can i have some more, Travelling in Mary Janes, MEETOO, The Misadventures of MissC, Hedonistic Habits, Dangerous Duplicity, Extra-ordinary Ordinaries, melbourne gastronome, paleo dining, The Secret Life of a Chef's Wife, The Chommery, the wrong beginning, Nurikko Visits, Popcorn & Toast, theworldofIRA, Kish + Co and Spaghetti Blogenese. Poor service soured visits from eyes on the fries and Let Me Feed You Melbourne. Accessibility: Colonel's Tan's is accessed via two flights of stairs, and I'm not aware of any alternative entries. Inside it's poorly lit and loud, with a mixture of reasonably spaced couches and tables. We received full table service and didn't visit the toilets. Some nights you just need a simple and filling meal - we often fall back on the lazy option of Fry's schnitzels but managed to come up with a slightly healthier plan on Tuesday night. We had broccoli and zucchini to use up and Cindy had this easy recipe from It Ain't Meat, Babe bookmarked so we joined the dots. It's incredibly easy - a bit of veggie and tofu chopping and 15 minutes or so of cooking. And it's pretty tasty - soy sauce in a pasta dish struck me as a bit weird while I was making it, but it worked well. In some ways it's closer to a noodle dish than a pasta, and I found it was even better with a light sprinkle of chilli flakes on top. The leftovers were great for lunch the next day as well. Toss the tofu in half of the tamari and leave it to marinate while you get started on the rest. Get a pot of water on the stove for your pasta - hopefully it's boiling for you by the time you need it. Heat the olive oil in a big frying pan over low heat and cook the garlic, stirring constantly for a few minutes - you want to get it nice and cooked without letting it cross over into burned. Add the tofu and turn the heat up a bit, stir-frying for another few minutes, until the tofu cubes start to brown up a bit. Now is a good time to get your pasta in the boiling water! Tip the veggies into the frypan and stir everything together thoroughly. Pour in the stock and the remaining tamari, cover the pan and let the veggies steam, stirring occasionally. You want most of the liquid to simmer off and the broccoli to be cooked but not soggy. Drain the pasta and stir it in with the tofu and veggies, along with the pine nuts. Serve with a sprinkling of chilli flakes if you're that way inclined. Our semi-regular pub-club has been limping along lately, with our last instalment (at the Cornish Arms) attracting a record low turn-out. For a variety of reasons, we somehow exploded this week into a group of almost twenty willing pubbers, meaning we needed a venue that could squeeze a big group in at the last minute. Enter The Union Club Hotel. It served us well on a previous pub-club visit and had plenty of space in the dining room for us (even if we did end up split over two tables thanks to the 30+ birthday group in the corner). The menu has changed since last time but there's still a vegan-friendly burger on offer, the soy chilli tofu burger with tomato, lettuce, onion, cucumber, coriander and eggplant relish ($17). Importantly, the chips were done pretty well (there's nothing more disappointing than bad pub chips). The burger was pretty good too - a chilli-soy marinated tofu chunk with fresh salad and a tasty eggplant mush on a decent bun. Goes well with beer. Cindy went a bit more upmarket, with the arancini balls (field mushrooms and parmesan with a gorgonzola sauce, served with a rocket, radish and pear salad, $18). I didn't manage to sneak a bite but Cindy seemed pretty impressed with these, even managing to finish her meal before some of our dining buddies. The arancini had a nice firm fried skin on them but were filled with creamy, cheesy rice flecked with mushrooms. The salad was a pleasing effort too, after her disappointment last time. The staff were good humoured and relatively efficient, despite the difficulties of dealing with two massive groups (although one of our friends' orders was delayed briefly). I really like the vibe of the pub too - it's got a lovely outdoor area, a nice rooftop and a good mix of dining tables, lounges and standing areas. And a pool table. The food falls a smidgen short of the standards set by Collingwood champs The Gaso, The Fox and The Gem but it's a reliable option in a crowded pub landscape. We'll be back. Read about our previous pub-club visit here. Since then, only the parma-obsessed folk at Parma Daze seem to have posted about it. Accessibility: A small step on entry and a moderately spaced interior. Ordering and payment happens at a typically high pub bar. 06/11/2012: We're sad to report that Purple Patch has now closed. Recently our friend Clamps joined the Purple Patch kitchen! We stopped by for Sunday brunch to check out his skillz. There's now a dedicated weekend breakfast menu with lots of things on toast plus a vegan pancake plate. Never too shy to fry, Clamps whippd up an off-menu plate for each of us (and I think we paid $16.50 apiece) - mine featured multi-grain toast smothered in scrambled tofu, deep-fried potato, veg sausages, corn fritters, slow roasted tomatoes, port-marinated mushrooms and tomato relish. (Potatoes excepted, all these items are listed in dishes on the menu going for the same price.) While the scramble was a little dry, this was a triumph in vegan fry-ups. Most notably, they've really worked on the relish since our first visit; this one had a deep colour and flavour and brought out the best in the sausages. The Purple Patch display cabinet rotates its offerings regularly - if you're lucky enough to come by their sweet and sour tofu, I'd highly recommend it! And their vegan passionfruit yoyos ($3) are stunners, I refused to leave without two for the road. You can read about our first visit to Purple Patch here. Since then Mel from Veganise This! has also stopped by. Accessibility: The door looks to have a small lip on it. Inside there's a wide passage and then large, somewhat crowded tables. Ordering takes place at the table, with payment at a low-ish counter. The bathroom is unisex and a little on the crowded side. Last month I shifted departments at work. I'm still in the same general field and collaborate with many of the same awesome people; I remain on the invite list for the annual lab culinary competition. But I'm considerably more distant from the lovely officemate I've had for the past two years. Our research interests don't overlap much but we've shared a supervisor, cat stories and a love of cooking. We both subscribe to the same vege box service and have often traded ideas for using up the latest windfall. She showed me this recipe when the quantity of carrots began increasing. Unlike the carrot cakes we commonly encounter in Australia, this one blends up the vegetable for a smoother, lighter batter. I didn't succeed in completely pureeing my carrots but I did enjoy the light-yet-sturdy crumb of my cakes, a similar texture to flourless cakes based on almond meal or polenta. I also used raw granulated sugar and it didn't completely dissolve, lending the cakes a lively uneven sweetness and thick caramel crust. The biggest surprise was the chocolate glaze. While I was anticipating something thin and sugary, its richness approaches a ganache! And it does a smashing Donna Hay dribble. I don't think afternoon tea could look or taste much better. Preheat an oven to 180°C. Grease a muffin pan - I actually made 15 cupcakes and so greased a few ramekins as well. In a large bowl, sift together the flour, baking powder and salt. Stir in the sugar. In a food processor or blender, puree together the carrots, eggs, oil and vanilla until as smooth as possible. Mine still had noticeable carrot texture even after many minutes of blending, and the texture of my cake was a little coarse (but pleasant!). Pour the carrot mixture over the flour mixture and stir them to combine. Spoon the cake matter into the muffin cups (until about two-thirds full) and bake the cakes until they pass the skewer test, about 25 minutes. Use a knife to gently separate the cakes from the tray; I just flipped them on their sides in the tray to cool a little. In a small saucepan, stir together all the ingredients over a medium-low heat. When the butter is completely melted and the mixture is smooth, bring it to the boil for a couple of minutes. Set the glaze aside to cool and thicken further for 10 minutes, then drizzle tablespoons of it over the cakes. Thursday marked 12 years since Cindy and I went on our first date (to this shockingly romantic documentary about the Munich Olympic killings) and we decided to go somewhere fancy to celebrate. Given we made this decision on Monday we weren't confident of getting a booking anywhere flash, so settled instead on one of the pioneers of the no-bookings scene, MoVida Next Door. We visited the original MoVida a few years back and found it pretty enjoyable, so we had high hopes for its popular little offshoot. Turning up at 7:30 we were, of course, unable to waltz into a table. Still, it only took ten minutes or so loitering at the bar with some delicious gin & tonics for things to open up for us on the other side of the bar. The amount of gin and tonic left in Cindy's glass below is some indication of how brief the wait was (although it must be said, the glass just out of shot to the left is substantially emptier). Things got started with some hefty chunks of bread and a little pot of very impressive olive oil for dunking. While we chewed our way through the crusts, we sussed out our options. The menu doesn't have quite the vego range of MoVida proper (no poor man's potatoes! Woe!) but there were still more than enough for us to cobble together a pretty excellent meal. Very few (if any) of them were vegan, but Carla seems to have had some luck in the past, so it probably wouldn't hurt to ask. We started with the one vego option on the massively long specials board: the tortilla ($3.50), a Spanish omelette stuffed with potato and onion. It was lovely and creamy, and Cindy's initial decision to give it a miss was soon overturned. Next up were my favourite dish of the night: the fried croquetta of wild mushrooms ($4 each). The only downside to them was the temperature they came out at - eating them was a balance between just wanting to stuff these crispy-fried balls of earthy mushroomy goodness in your mouth and avoiding the inevitable tongue burns from too much enthusiasm. I ordered an extra one while we were pondering the dessert menu later in the meal, but still didn't quite let it cool down enough. Hot on the heels of the croquetta came the berenjenas (eggplant chips with salmorejo, $12.50). These were like lightly tempura-ed slivers of eggplant, with a chewy skin and meltingly soft innards, all coated in oily crispy goodness. The sauce was a creamy tomato-based mix, which provided a bit of a different flavour to dip the chips in but wasn't otherwise particularly memorable. The next two dishes came out together - firstly, the big plate of ensalada (apples, iceberg lettuce, Spanish onion, hazelnut with salmojero dressing, $11.50). Huh, I only just realised that the salad dressing was based on the same flavours as the eggplant sauce (it turns out salmorejo is a tomato and bread based soup!). I really liked this - apples and red onions are a winning flavour combination (which reminds me, it must be time to make this again soon) and the dressing was salty and creamy in all the right proportions. Added health bonus: nothing on this plate was deep-fried! Alongside the salad were these two little piquilo peppers, stuffed with pisto manchego and topped with aioli ($4.50 each). After making the inevitable mess trying to manoeuvre one of them onto my plate, I happily chomped my 'deconstructed' version down. The salty cheese and sweet pepper were beautifully offset by the strong roasted garlic flavour coming through in the aoili. They packed a lot of flavour, and two would have been too many, but one was more or less perfect. We'd been eyeing off the dessert menu all night, and were in complete agreement about the two dishes we wanted to split: the chocolate marquise and the tarta de queso. Sadly, there was some misunderstanding, and we ended up with churros ($12) instead of the marquise - neither of us cared enough to rectify things, and we consoled ourselves with perfectly crunchy doughnut sticks and a rich chocolate sauce (both of us ended up scooping the chocolate out in spoonfuls once the churros themselves had disappeared). The tarta de queso came out as expected (goat's milk cheesecake with rhubarb sorbet, $13.50) and was just as good as I'd imagined. The cheesecake was an intriguing disc of mushy goodness, with a nice, tart cheesiness to it. The texture came from the strip of breadcrumbs laid down the middle of the dish, while the rhubarb sorbet was tangy and smooth. I happily picked away at the cheesecake piece at my end of the dish - it went well with the other components, but was a highlight even on its own. Movida Next Door is a tight little space - after sizing it up, Cindy and I reckon that the staff have as much room in their combined kitchen/bar area as the customers all cosied up around the bar and a mix of communal and small tables. Despite our mix-up on the dessert, we were very impressed by the service - they work the crowded room efficiently and effectively, never leaving you alone for too long but not stopping by so often as to be annoying. Everything came out quickly, and you really had the feeling that this was a place where everyone knew what they were doing - it was a well-oiled machine. It's also pretty good value - we walked out of there well satisfied by how much we'd eaten, and only about $120 down (including four drinks). Definitely one to add to your lists. 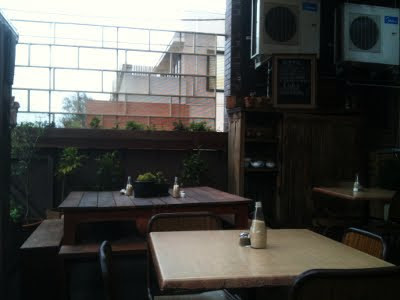 Only Carla seems to have blogged Movida Next Door from a veg*n perspective. Otherwise it gets rave after rave after rave - see: Mademoiselle Mange a Sydney, The Hungry Excavator, Sir and M'lady Dine Out, spicy icecream, Sweet and Sour Fork, Food Food K, JENIUS, Mel: Hot or Not, Kish and Co, eatshowandtell, Seasons of Life, A Food Story, Brave Bird Fly, Hold the Peas, Tasting Melbourne, Miss Adriennely, multicultural melbourne, Fork, Knife and Chopsticks, Off the spork, A Daily Obsession, Ooh, Look, The Food Blog, juganaut's foodie thoughts, Apple in a Bun, Eating Melbourne, Melbourne Dining Experiences, Wayfaring Chocolate, food, glorious food, CW's Food & Travel, EATspeak, The Very Very Hungry Caterpillar, melbourne gastronome, consuming design, Are you Hungary?, choieevon, Food Sailor, The Empty Fridge, Demitasse Demi-sel, here comes the food, My Food Odyssey, GreenTeaSpoon, I Ate it All, doublecooked, I just ate it, Barley Blog, The Learner Chef, Life in a Bottle and tubbymasu. There are just a couple of more negative opinions out there - Food Fable didn't think MND was great value for money while Eat (almost) Anything at Least Once found the service disappointing. Accessibility: Terrible. I'll leave it to Chekoala to summarise all the ways that Movida Next Door falls short here.